Winter. Star Wars. Holidays. 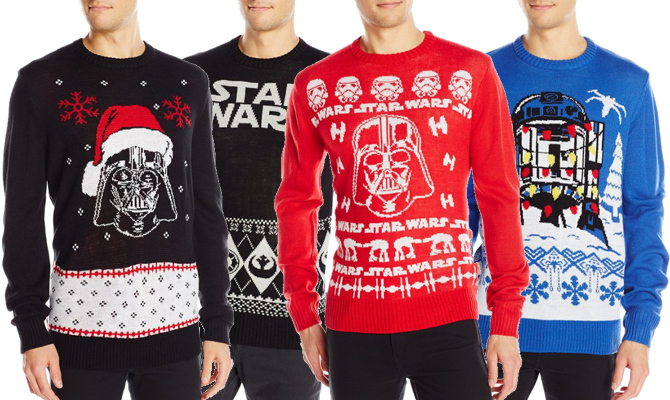 All together now… Star Wars Holiday Sweaters! Whether it’s R2D2, Vader Claus, Holiday Star Wars themed, or just plain old awesome Star Wars, there’s a sweater option for you. These 100% acrylic pullover sweaters are incredible. Each design offers something different for the Star Wars fan making it hard to not pickup all four right now. Whether its an ugly sweater party, a day at the office, or something needed for the premiere of Star Wars: Episode VII, these $30 sweater options are perfect for the geek in your life as well as you. Nicole Kidman Joining ‘Wonder Woman’ Movie?